What is Custom LASIK Eye Surgery in North Canton, Canfield & Alliance, OH? Custom LASIK eye surgery, known also as wavefront-guided LASIK, is the most advanced, individualized treatment available for refractive errors in Canton, Alliance, and North Canfield OH. Roholt Vision Institute has over two decades of experience in achieving great surgical results for their patients. 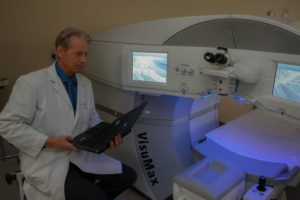 A commitment to the best technology, continued analysis of surgical outcomes, advanced staff training and a caring attitude combine to make Roholt Vision Institute the best choice for your refractive LASIK eye surgery procedure. What are the advantages of Custom LASIK Eye Surgery? The FDA has approved several systems for wavefront (WF) eye treatment. Studies have shown the superiority of WF over conventional or “optimized” treatment. The Zyoptix™ ACE eye-tracking system used at Roholt Vision has the unique ability to track in the rotational dimension which improves the correction of astigmatism. Dr. Roholt is qualified to treat patients with both the Zyoptix™ and the CustomVue™ systems. He generally prefers Zyoptix™ because of the wide range of pupil diameters that can be treated. Dr. Roholt was the first in Ohio to perform wavefront-guided LASIK eye surgery with the advanced Zyoptix™ system. Wavefront sensing technology (WST) acquires a measurement of the entire visual pathway of the eye and provides a unique “fingerprint” of the eye. Most surgeons use a “corneal topographer” which creates a map of the corneal surface. B & L’s Orbscan™ adds more detailed information about the front and back surfaces of the cornea which a conventional topographer cannot do. This analysis, available at Roholt Vision Institute, gives us unparalleled precision in performing your vision correction procedure. At Roholt Vision Institute, we provide CustomCorrection™ for each patient. Not every LASIK eye surgery candidate can have Zyoptix, and some patients are better suited for conventional LASIK, which is called Advanced PlanoScan. What makes a good candidate for LASIK, SMILE or KAMRA? A good candidate for eye surgery has normal corneal curvature and thickness, normal tear film and a prescription within the range that can be treated. All of these items are checked in detail as part of the no cost consultation. How old do you have to be to have LASIK or SMILE? Typically, a patient should be 21 years old with a stable prescription for the past 2 years. How do I know which eye surgery procedure is best for me? Through a detailed, no-cost refractive eye surgery consultation, the doctors of RVI will help you determine which refractive surgery procedure will best allow you to meet your visual goals. How long will the results of my eye surgery last? LASIK and SMILE permanently alter the power of your visual system and that result will not wear off over time. However, some individuals will have small changes to their eyes as part of the aging process and this can affect the clarity of one’s vision. For this reason, RVI recommends that patients see their optometrist yearly after refractive eye surgery to monitor the vision and evaluate the health of the eyes. How long until I can go back to work after LASIK eye surgery? LASIK or SMILE eye surgery is typically done on Fridays, and patients are able to go back to work on Monday in most cases. Is LASIK eye surgery it painful? Minor discomfort such as you would have with a dry eye or a mild foreign body sensation is common but significant pain is unusual. What restrictions will I have after refractive eye surgery? You will be asked to refrain from using eye make up for 1 week and to avoid going underwater for 1 month after eye surgery. Roholt Vision Institute proudly provides patients from North Canton, Canfield, Alliance OH and surrounding areas with LASIK eye surgery. Contact us today to schedule your free LASIK consultation!